Negativity on Yelp often causes trouble for business owners, sometimes due to unwarranted or derogatory reviews. When this happens, it’s essential for you to know how to delete a Yelp review. Yelp for Business Owners is an extremely robust platform. Through it, businesses can take reservations, show offers, build loyalty, answer questions, and more. But Yelp is known for its reviews. Not just any reviews, though. Yelp is renowned for its complicated Recommendation Software that decides which reviews to show and which to hide. This leaves business owners with a few different hiccups to work through. First, we’ll take a look at how Yelp works internally then dive into how to delete a Yelp review. Keeping that in mind, let’s say your business got a really terrible review that doesn’t seem like a genuine experience. There’s inaccurate information and false accusations. The software should theoretically prevent people from seeing any such review, but the Yelp Biz account owner will still see it. And there really is no guarantee no one else will see it as well. Of course, a blatantly fake review is something you would want removed, but Yelp tends to stay out of word-of-mouth disputes. When you report a review, keep in mind that Yelp usually will not side with the business. In any case, for all questionable reviews, you should go through the following steps to have them removed. First and foremost, always analyze the review before you run to Yelp to delete it. You want them to take your side when a review really presents an issue and if you report too many reviews, they will probably start denying them out of habit more than merit. Ask yourself a few questions. Why did you really get the review? Is it fake? Was it a real experience from a customer? Do they have a reason to be upset? Dig deep and find out the root of the issue. The only way that Yelp will remove the review is if it violates their guidelines. If you don’t think the review meets the community guidelines, report it. If you’re in doubt, get a second opinion before you report the review. Your business could get penalized if you falsely report too many reviews. 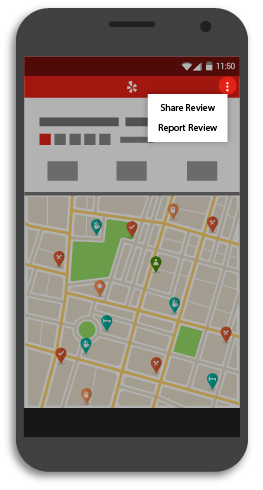 To report the review, go to your Yelp Biz mobile app or dashboard on a web browser. Once you’re there, find the review in question and click or tap on it. There will be a menu, indicated with a dotted icon, that allows you to report the review. 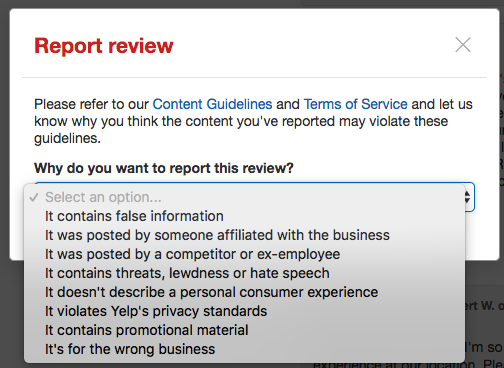 Once you’ve chosen “Report Review,” Yelp will prompt you to tell them why you’re reporting it. It’s important that your reasoning matches their guidelines. If you need help learning how to report a review, Yelp has more documentation here. Even if the review you reported is still under consideration, you should respond publicly in the meantime. It’s important to respond to your negative reviews so that other potential customers can see that you care and you’re responsive. Yelp has a step by step guide on how to respond to reviews on their platform in a variety of ways. We’ve also written some guidance on how to respond to a negative review to help you draft your responses. Once you’ve responded publicly, send a private message to the reviewer. Sometimes if you reach out, they will change the review themselves. Make sure what you say is genuine and you are not defensive when you reply. Keep an eye on the situation to see what happens. Did Yelp do anything about the review? If not, should you follow up or just find ways to drown it out? If your report was rejected and the review prevails, you can always follow up with their contact form. Chances are that your reason and the review content just didn’t seem like enough to justify taking the review down. Yelp is very careful that their review platform remains organic and truthful. 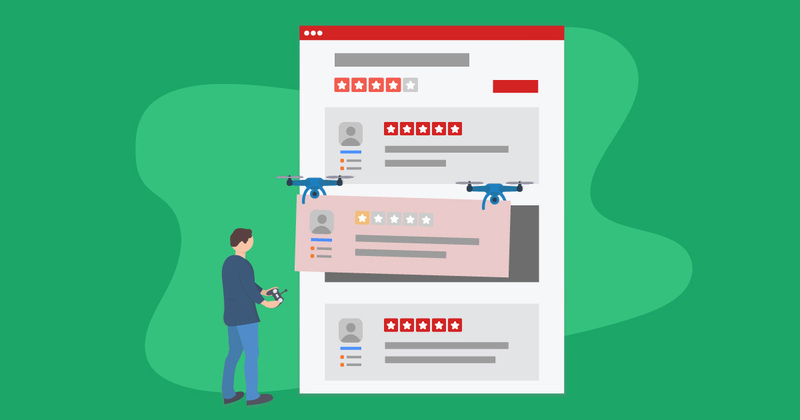 Yelp’s complicated review filter and anti-soliciting policies make combating negative reviews with positive ones more challenging, but not impossible. Their strict policies are actually great for you because now you can enhance your entire business by building positive habits into your everyday routine in order to generate more reviews across all review platforms. Yelp has its own tips for success that are specific to the platform. To build good habits and get more reviews regularly, we an article on how to do that, here. The important thing is to promote reviews for your business without being pushy or violating Yelp’s rules. The last and final method to get rid of that pesky negative review is to outrank your Yelp page on search engines. That starts with putting all of your positive reviews on your website. By doing this, you actually boost your search engine optimization (SEO) and show potential customers your trustworthiness. With a business reviews plugin for WordPress, like WP Business Reviews, you can display your best reviews beautifully anywhere on your website. However, if your goal is to outrank your Yelp page, then you need to think strategically about how you go about it. This webinar on putting reviews on your website walks through two different methods. The first is to create an aggregate review page with all of your reviews lumped together. The second is to separate them out by topic. Separating your reviews out by topic is a technique that will help with specific search terms related to your business. By separating them and providing more structure, you will help your reviews page increase in its search engine rankings. We stay up to date on the latest review platforms and their many quirks. Sign up for our newsletter so you can stay informed too.